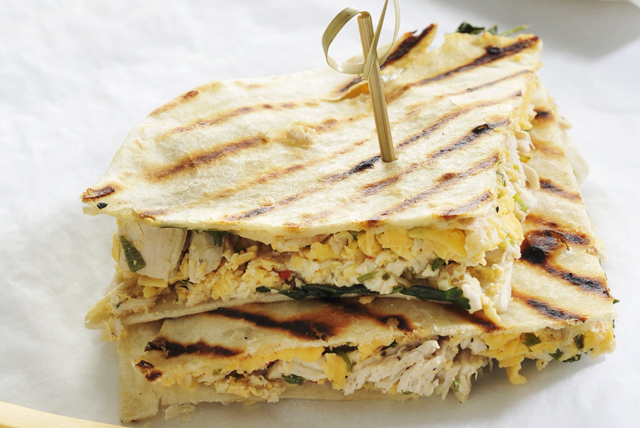 We've made this quesadilla recipe super easy to make by using shredded rotisserie chicken. And the spicy cheese and bbq-ranch dressing team up to add the perfect blend of flavour. After one taste, you'll be asking for a repeat performance. Mix dressing and Sriracha sauce until blended. Add to chicken in large bowl along with the onions; mix lightly. Spoon onto tortillas; top with cheese. Fold tortillas in half; press tops to flatten slightly. Grill 2 to 3 min. on each side or until cheese is melted and quesadillas are lightly browned on both sides. Add 1/2 cup chopped roasted peppers to chicken mixture before spooning onto tortillas.